We managed to run a couple of benchmarks on the Desire Eye and it scored impressive results. It performs virtually on the same level as the HTC Butterfly 2 (even though that one has the overclocked Snapdragon 801 version) and it easily stands up to flagships like the Samsung Galaxy S5, Sony Xperia Z3 and LG G3. 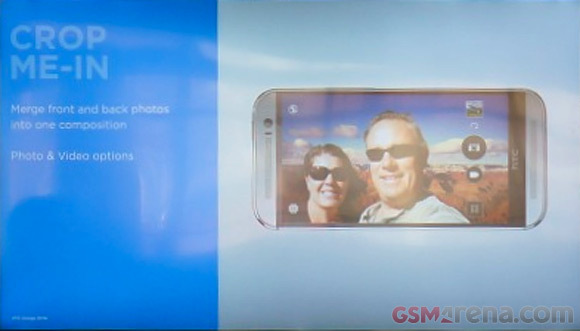 We called the front and back cameras identical but that's not entirely true. 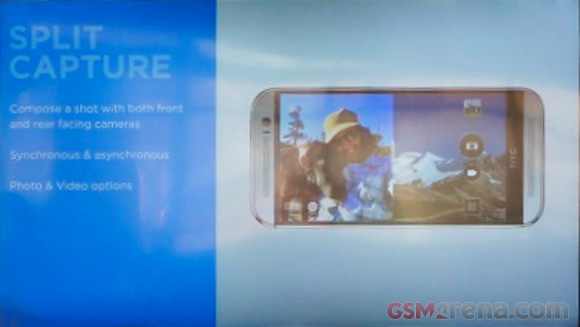 The back camera has an f/2.0 aperture and 28mm field of view, while the front camera has a 22mm f/2.2 lens. Either way, the cameras are very fast, photos are snapped with impressive speed. To further highlight its importance, the front camera is the one that launches by when you press the hardware shutter key. 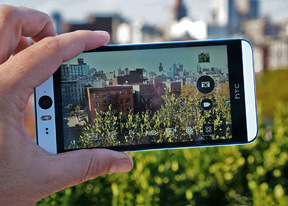 The HTC Desire Eye also has multiple camera modes designed around using the front camera or both. Some of those are useful, others are gimmicks good for one or two photos. 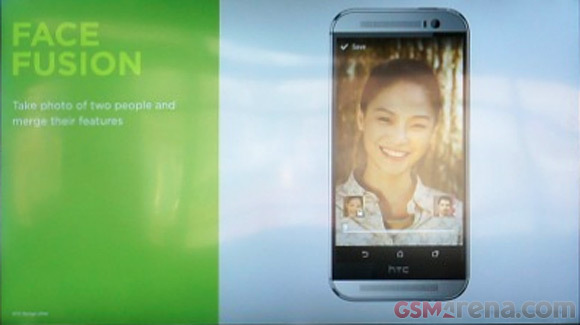 Here's a video of the camera UI of the HTC Desire Eye in action. Split capture divides the screen in half, one piece for each camera, and lets you snap photos or record videos. You can shoot simultaneously with both cameras but you don't have to, you can capture each side in turn, which makes good framing easier and more comfortable. 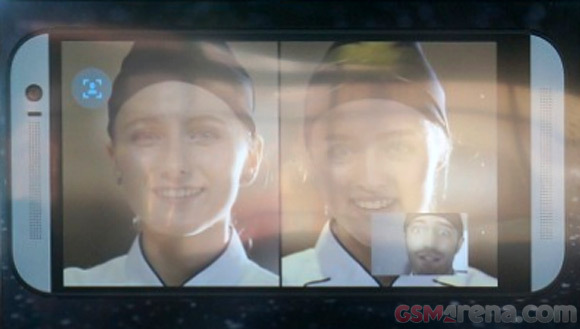 If the split-screen effect is too jarring, the Crop-me-in feature can also try to composite you into the shot - cut you out of the image taken with the front camera and paste you into the image with the back camera. In our (admittedly limited) experience with this feature the software isn't perfect in tracing your outline but does kind of okay for an automatic process. Like Split capture, this feature works for both photos and videos. Face fusion is another attempt at an automatic Photoshop job - it takes two faces (one from each camera) and melds them together. You get a slider that controls how closely the final result will resemble each of the faces. A decidedly more useful feature is Video Chat Control. It can track up to 4 face at once and keep them consistently centered in their frame, which is good for teleconferencing. You can also share a video of the phone's screen during conference calls. We managed to snap several samples with both the front and back cameras. Yes, HTC took us a helicopter ride, so note that the aerial shots are through glass, which mucks up the image quality a bit. We made comparison shots with the front and back cameras. The front-facing camera is noticeably wider than the back camera, which puts it at a bit of a disadvantage but the overall image quality between the two cameras is very closely matched. Finally, here's a quick video sample we shot. At the end you can see the digital zoom in action, the result looks pretty good. We have some good news for current HTC owners: the company promised to distribute some of the custom camera modes to existing devices, though obviously the results won't be as good even on the 5MP selfie cameras that HTC is employing lately.